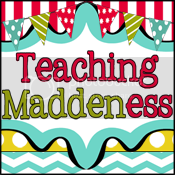 It's SWAPSVILLE today in bloggy teacher land! You should know by now that the Blog Swap and Hop is going on all over teacher blogs this wonderful Saturday! Though I am not involved, I have hopped over to MANY blogs and added MANY freebies to my Teacher Resources folder on my computer! YAY! If you have yet to explore this amazing event, DO SO IMMEDIATELY (well after reading this post, of course). So many goodies for you, as well as awesome tips from amazing teachers! I have a couple of linky parties I just HAVE to link up to today, but I also want to tell you about some AWESOME GIVEAWAYS!! We are supposed to share about music in the classroom!! I love music, and it is NECESSARY in my classroom! Music does so much for us- it engages us, the lyrics stick in our minds, and it changes our mood (which can be happy, sad, angry, etc.) Finding the right music for your classroom and for your students is of utter importance. We need to find music that uplifts them and helps them learn. 1. In the morning, when students first walk in the door.What the students first interact with as they walk into your room has a huge role on how they will take on the day. I plan to have either classical or acoustic music playing softly in the background- no words, just instruments. This gets the students cued right into learning. This is a time when I will use music that still is somewhat calm, but may have some lyrics or fun included. This way students are still learning, and the music is helping them. 3. Learning a new concept, or practicing others. Finding songs that are fun and interactive are a great way to help teach a concept, and they'll remember it better! I remember when I was teaching about bats in a lesson I found a song about echolocation and my students had that song stuck in their heads the rest of the day! During transitions and times when we need a brain break, I will use FUN music to get them up and moving! This is plain and simple. Soft fun music to keep students working. My absolute FAVORITE way to get music for my classroom is Pandora! If you have not heard of it, it is an online radio where you choose what artists/genres you want to listen to, and they make a playlist out of it for you. There are definite BENEFITS and DOWNFALLS of Pandora. Benefits are, you have great music to play for the classroom and can choose from a variety of genres, artists, and types of music. I have several playlists for the class at different times. The downfall is there is always that fear of the wildcard. Maybe my class is transitioning from centers to math and I have a station on, and an Usher song comes on. It not only is inappropriate for school and for students, but it totally disrupts the flow of the class! There are a couple of ways we can decrease those wildcards. Stephanie at 3rd Grade Thoughts has a GREAT post on music, where she says that to decrease the probability of wildcards, you need to work on your stations this summer. Play the ones you want to use in your classroom and use the rating system (thumbs up/thumbs down) to tune your stations to what you want to hear. Another way, if you have a mac, is to download a program where each song played on Pandora is downloaded for free onto your computer. Then, you can throw out the wildcards and play what's on your computer. I was a student teacher this past year, and would love to give my input. I had wonderful cooperating teachers who taught me so much! Here are some tips I have for those of you who are hosting a student teacher. 1. Invite them in on the planning. Some of my favorite parts of student teaching were when we would collaborate together on a project, unit, lesson, etc. Print off your lesson plans so they can have a copy. Have them help you brainstorm for different things. I loved the fact that we would sometimes co-teach together. 2. Make them feel welcome. How do we make our students feel welcome when they first enter our classrooms? We give them their spot in the classroom, we build rapport with them and each other, we give them tools that will help them ease into the class easier. This is what you should do for the intern that is coming to your class too. At one of my placements, I had my own little desk. I just used an extra desk the teacher had in the classroom that was being used for storage. I didn't need much, I kept most things in my bag. But it was nice to have a place to put what I needed to have out for the day, to have my own pens/pencils for the students, a stapler and some stickies on my desk. Nothing fancy or huge, just somewhere I could call "home" in your room. You could also use a group meeting table, too. The only thing about that was I was moving my stuff around 5 times a day. But that also works. Also, BUILD RAPPORT. Introduce them to the class by the name they want to be called (Miss Elliott) and let them ask the 50 bazillion questions they want to ask! One class had an "interview" time with me, and it helped them get to know me better. I also loved having my own roster of the class, knowing who was ELL and who was special ed, and a schedule. Again this doesn't have to be anything crazy, just a little bit of info for your classroom. It just helps put names to faces and gets the routine down. 3. Give opportunities to grow. The first couple of weeks are normally pretty slow for Student Teachers. We are observing and getting to know the class. A great idea would be to hand something small over to them every once in a while to boost their confidence and help the students get more comfortable. It could be a read aloud, a math test, a small group teaching time, etc. If you do watch their lessons or even how they interact throughout the day, go over some with them, and give them constructive feedback. It really helps give direction to what we need to work on. I know it is so hard to release control of your classroom, but it really is what we need. If your student teacher has not proven their trust, then don't. But please, don't keep all control of the classroom! We are supposed to fail sometimes, but we learn how to pick ourselves back up. If you are really worried about leaving the classroom for some time, start off little. Maybe the first time is just to run down to the office real quick, about 5 minutes. Then build your way up. That way they can gain control and confidence, as well as build their own relationships with the students in the classroom. There will be some kids who ask, "Where's Mrs. __________?" but that gets less and less the more you give over control. That is the ONE thing that we really don't get enough of in college. We need classroom management experiences! Share what you do in your classroom. Share what works and what doesn't work with your kids. Allow them to try out new things. Help them develop that "teacher voice" and "teacher presence". That is one thing I am SO grateful for! I hope that helps you who may have a student teacher in your class! 2. I have a big number on the horizon! 5 more followers til 50! Make sure you follow my blog for updates on my giveaway and TPT Store GRAND OPENING! Woo hoo...the Grand Opening of your store coming soon! YAY you! Love the post about student teachers! I actually asked my former intern to do a guest post for me sometime on this very topic...what it's like to be an intern, what's helpful from the mentor teachers, etc. It'll be interesting to see if she has some of the same thoughts & suggestions! They're great! Finally, I'm awarding you the Versatile Blogger award! Swing on over to check it out! Thanks for joining the linky party, Allie!! I love Pandora, but haven't used it in the classroom for fear of the "wildcards"...looks like I need to play around with it a bit. 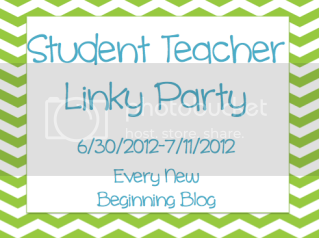 I'm going to check out the student teacher linky!